Greek Orthodox Community of Melbourne and Victoria - The Feast Day of the "The Annunciation of Our Lady"
On Friday 25 March, the Greek Community’s historical church "The Annunciation of Our Lady", celebrated its Feast Day with the Divine Liturgy officiated by His Grace Bishop Iakovos of Miletoupolis in the presence of the Consul General of Greece Ms Christina Simantirakis, the Vice President of the Thessaloniki Tourism Organisation and Olympic gold medallist Ms Voula Patoulidou and hundreds of parishioners. The festivities commenced on Thursday evening with the service for the Feast of the Holy Annunciation of Our Lady celebrated by His Grace Bishop Ezekiel of Dervis assisted by a large number of Orthodox priest and attended by hundreds of local parishioners. 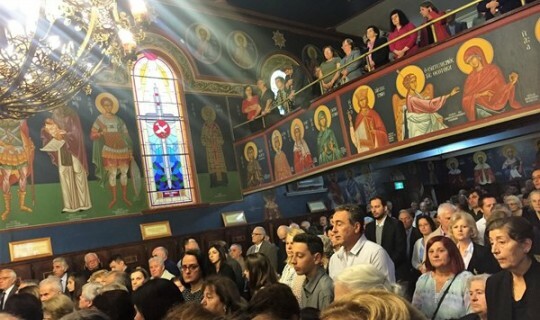 On the day of the Feast, parishioners and guests were greeted by Greek Community members dressed in traditional national customs celebrating Greek National Day and the Independence of a nation. The festivities were followed by a luncheon at the rooftop restaurant "Melina” situated at the Greek Cultural Centre organised by The Very Rev. Fr. Kosmas Damianides and the ladies auxiliary committee in aid of the Church.